Princess cut diamonds are the second most popular diamond shape. Princess cut diamonds possess the gorgeous sparkle of round brilliant diamonds in a distinctive square shape. They offer a contemporary look and the flexibility to work in almost any style of ring. The princess cut diamond, first created in 1980 by Betzalel Ambar and Israel Itzkowitz, is the most popular fancy cut, especially for engagement rings. Like round cut diamonds, princess cut diamonds are a good choice for their flexibility in working in almost any style of ring. Much like the round brilliant, the princess cut is a classic and elegant shape, although with its sharp corners boasts more of a contemporary edge. This shape is ideal way to capture the brilliance and simple elegance of the round and still be "a la mode". The Princess cut is the square version of the brilliant round cut usually comprised of either 57 or 76 facets with a typical ratio of 1.0 to 1.05. Its pyramidal shape with four bevelled sides creates more light dispersion than any other square shaped diamond, making it popular for both solitaire engagement rings and earrings. As it is a patented cut, it may be referred to as a Square Modified Brilliant on a laboratory certificate (eg. GIA or AGS), or a Rectangular Modified Brilliant if it has a ratio greater than 1.05. Because of its extra facets, the princess cut can disperse more light through the stone, this serves to hide inclusions more efficiently, making it the most brilliant of all square and rectangular shaped stones. It is also a popular cut for wedding bands because the stones can be arranged side by side without any gaps, making it ideal for an eternity band too. Furthermore, due to its sharply squared corners, the Princess is an ideal cut for long fingers. Princess cut diamonds also tend to have a slightly lower price per carat than round cut diamonds. This is because the four sided pyramid shape of the princess cut diamond is similar to one half of the octahedron rough stone from which a princess diamond is cut. This similarity allows two equally sized princess cut diamonds to be cut from the same rough stone with relatively little waste (roughly 60% of the weight of the original rough stone is retained after cutting). The greater efficiency, or yield, translates to a lower price. Carat for carat, the crown surface area of a princess cut is about 10% less than a same weight round diamond. However, the corner to corner measure of a princess cut is typically 15% greater than the diameter of a same weight round diamond, creating the illusion of greater size. The princess is traditionally a square cut (four sides of equal length). However, many princess cut diamonds are slightly rectangular, though this is often hard to detect. All other things being equal, the more rectangular a princess cut diamond, the lower the price. 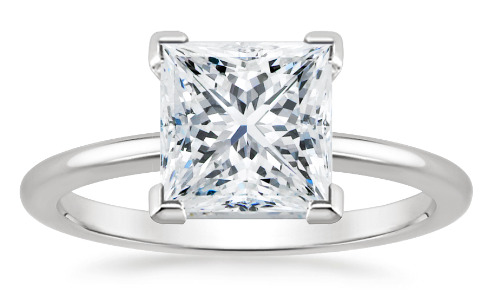 Many buyers actually prefer a slightly rectangular princess cut; it's all about finding what is most pleasing to you. Any length to width ratio of 1.05 or less will appear square to the naked eye. If the princess will be set with side diamonds, a length to width of 1.05 - 1.08 may still look square, as the side diamonds will create the illusion of greater width in the center stone. A princess cut diamond should always be set with prongs that protect the four corners (the most likely location for chipping). Because these corners were once near the outer edge of the rough stone, flaws such as naturals, extra facets, and other inclusions may be located here. Since the corners are covered by the prongs, these flaws will be invisible once the diamond is set. The only remaining concern would be if the flaws are significant enough to affect the stability of the diamond (this is extremely rare, however). Most other square cuts (such as emerald, asscher, and radiant) have cropped corners. Of all of the square cuts, the brilliant cut princess (along with the radiant cut) comes the closet to achieving the fire and brilliance of a round diamond, making it an ideal combination of unique shape, sparkling appearance, and relative price value. The name "Princess Cut" was originally used in connection with another diamond cut known as the "Profile" cut, which was designed by London cutter Arpad Nagy in 1961. The same name was later used and made popular by Ygal Perlman, Betzalel Ambar, and Israel Itzkowitz in Israel, who in 1979 created the Princess cut (or Square Modified Brilliant) as it is known today. Other precursors of the Princess cut include the Barion - a square cut with rounded corners created in 1971 by South African cutter Basil Watermeyer, and the Quadrillion - a similar cut with only 49 facets, also created by Perlman, Ambar and Itzkowitz and initially distributed by Ambar Diamonds in Los Angeles. Following several years of optical research, the modern Princess cut was created - a square stone of 58 facets arranged similarly to those of a round brilliant cut diamond.